Travel Alliance Partners, often referred to as TAP, has undergone significant changes this year, including retaining a new management company and hiring a new executive director to replace longtime leader Stefanie Gorder. Founded in 2001, TAP is a consortium of tour companies around the United States, each with its own area of specialty or regional expertise. The partnership consists of 28 members who buy and sell one another’s tours. The partnership allows each TAP member to offer its customers a wide array of products and gives the TAP partner that operates each tour a wider network of potential customers from around the country. The TAP catalog is large and diverse, featuring motorcoach tours, safaris, cruises, sporting events and other travel experiences. That idea was groundbreaking, and in the 17 years since its founding, TAP has continued to innovate with new products, ideas and events. Much of the creative drive came from Gorder, who served as executive director of the organization for nine years. “Stefanie was amazing for what she was doing,” said TAP president Nick Calderazzo, who owns the New York-based Twin Travel Concepts. “She grew TAP and created new programs. She was extremely dynamic and creative and reshaped what TAP was. Gorder’s departure brought the opportunity for TAP partners to look for a new leader with fresh perspective and a breadth of leadership experience. They found those in Lisa Doerner, who took over leadership of the organization this summer. “We wanted to keep the momentum of growth and change and being on the cutting edge of our industry,” Calderazzo said. “That’s how we ended up with Lisa. She doesn’t come from our industry, but she comes with a vast knowledge of different ways of doing things. Doerner has spent more than 20 years in business development roles at various organizations, including the Xerox Corporation and an association of technology professionals in Rochester. In addition to hiring Doerner, the TAP partners decided to expand their marketing and outreach efforts by retaining the services of Break the Ice Media, a marketing and public relations firm also based in Rochester. Break the Ice will serve as the organization’s management company and will bring its considerable tourism marketing experience to bear in promoting TAP through traditional and social media. Break the Ice has experience working with tourism clients such as the nearby Finger Lakes wine region. Though much has changed in TAP’s inner workings this year, the partners’ goal has been for the customer experience to remain smooth and consistent. “From the outside, you won’t see any difference at all,” Calderazzo said. Group travel planners can continue to count on the TAP programs and services that have made the organization a tourism leader for years. Among those is its signature series of Guaranteed Departures. 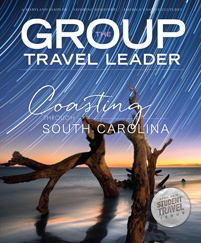 TAP was the first organization in the tourism industry to publish a catalog of trips that are guaranteed to operate from the time the first passenger signs up so that group leaders never have to worry about a trip being canceled. Calderazzo said the partners are adding more Guaranteed Departures than ever for 2019. Another program, TAP Into Travel Tuesdays, has been growing in popularity. This weekly webinar series offers travel professionals and trip planners free online education about destinations and other tourism issues each Tuesday at 2 p.m. Eastern time. Webinars are archived online so planners can access and view them at any time. TAP’s signature event, TAP Dance, will also continue uninterrupted. The 2019 edition will take place this June at the Little America Hotel and Resort in Cheyenne, Wyoming; more than 200 Preferred Professional Travel Providers from throughout the industry will attend. With a strong foundation and new leadership, TAP is poised for growth on various fronts in 2019 and beyond. Calderazzo said the 28 TAP member companies are also looking to expand their ranks by strategically bringing new partners aboard.